The Pavillion had been busy until twenty minutes ago. It was a spring day of a particularly soft, poignant beauty, fresh and sweetly scented by tender spring flowers. The City was so full of green and budding things that the light was tinged a hazy jade, and the River coruscated with viridian glints deep in its steely depths. Everything was steeped in languor and love and a kind of narcotic forgetfulness. The City, dreaming sweet dreams at last, extended this bohemian goodwill to all the inhabitants, and the girls and boys had donned romantic, revealing clothing and seemed to a one dewy-eyed and sweet. Even the pushers, hustlers, and housebreakers had acquired a faint blush of health and goodwill. The more proletariat elements of the City, for even that dreaming demi-god could not do away with the utility classes entirely, manifested this as a desire to take meals and refreshments outdoors, and descended upon the Pavillion’s singularly charming patio, with its emerald ferns and young linden trees, and the famous jade and lapis mosaic tiles. On the little path that ran between the Pavillion’s ornamental fence and the Rosecrown Canal, young peacocks, ravens, and feral ocelots made a great show of not begging, and were rewarded with bits of lamb phagius, lemon tarts, and strawberry cake. The staff could barely keep up with the orders, and the kitchen was running dangerously low on chervil and lamb, when two men sat under the awning without asking the maitre’d. One of them was very tall and emaciated and had two spots of color high on his wasted cheeks, rosy and deliciously girlish. He wore high, cracked cavalry boots, at least a hundred years old, a mean little striped tie, and a fashionable shirt of Corvaese lace under a yellow doeskin jacket. He looked as if he was building up a stylish wardrobe, but would never get there before the new style had set in. His friend, romantically peaked rather than mortally ill, was clad in an artful dishabille of spangled scarf and peacock colors. He had painted a little arc of crimson hearts from the corner of his left eye, as the more stylish convicts often tattooed tears. The staff stumbled over each other as they tried to dodge their table. “But if, as I am advocating, we create a revolution with no purpose, and overthrow, by force of arms or cunning or with considerable style, the establishment and all counter-revolutionary forces, we will have the wisdom to end it there! We’ll end it all, the revolution, the City, the whole miserable lot of us, revolutionaries, resisters, our whole race. “Really? I think the sooner we start, the better.” He stood, brushing the ocelot off his lap. It landed on The Pavillion’s famous jade and lapis mosaic with a hiss of displeasure. In pleasant weather, such as currently adorned the City, the Council abandoned their delicate little palace to attaches and underlings, and took refuge in the monotony of the countryside. The Council’s palace, never inclined to foster sobriety and proper consideration of law and order, was perhaps too louche, too sweetly rotted to be tolerated under fair skies. It was very old and had cunning stained glass windows of strange design, praying hounds and a heart pierced by star-tipped arrows, and it was poised on the very edge of the wickedest part of the River. In this hazy season, the water was choked with nenuphars, and even at the most sensible hours of the day the River glimmered with the reflection of their violet eyes. Before they left, the Council had caught one of the nenuphars, and installed it in a crystal cage in an exquisitely appointed room deep in the palace. It was assumed, among the secretaries and assistants left behind to attend to the Council’s business, that it was meant as a kind of warning or part of some poorly executed decorative scheme. It was the chief reason Amfion had invited Fancy to a private champagne luncheon at the palace. He had hoped, between the six courses of exotic champagne, the captured monster, and his new red leather boots, to appeal to all of Fancy’s weaknesses. “He fell in the River. He tried to climb out, but there was nothing we could do. They had him already, he had that awful purple light in his eyes. It was terrible.” He sighed and turned his back on the nenuphar. “But it’s very pretty, isn’t it?” Amfion said hopefully. “Aren’t they all? But how do I know that isn’t poor Leirion?” He was feeling rather drunk by then and the nenuphar, hissing and singing to itself in the crystal cage, depressed and attracted him. He had been drunk last night and had not, to the best of his knowledge, slept in three days. Fancy drank the champagne; this was the fifth course and he shouldn’t have gone past the third, but Amfion was well acquainted with his weaknesses. “What would I know about hierophantes,” he replied blithely. “You aren’t really going to go along with them, are you?” Amfion asked. He seemed to be taking it all quite seriously, and Fancy was beginning to regret that he had accepted any invitations to lunch. “I think so, but I could be getting it all wrong....” Fancy looked around for the sixth course. The nenuphar shrieked behind him. To the left of the Vermillion’s gaudy, decayed entrance was a steep, sheepish set of stairs guarded by a perfectly delicious psychopompes. At the bottom of the stairs was a room well stocked with salvaged divans and liquor for the entertainment of the performers at the Vermillion and their guests. They had brought up the lotus wine and Xerxinia was showing Sylvain how to make a clever variation on a la momisette with it. Fancy, who had already seen the trick once or twice before, was discussing one of the broader points of revelatory tonalism with Kyrené. It had been inspired by a particular shade of Xerxinia’s hair, which was dyed and arranged to look exactly like a peacock’s tail. “How on earth have I gotten by without you?” Sylvain said, and Xerxinia chuckled and stroked his gaunt face with her dull gold nails. Xerxinia's distress caught the attention of a stooped, spidery figure across the room, who pushed back a wide-brimmed hat and veil from two years ago. With the exaggerated care of the very tall and very drunk he rose and made for Fancy’s table. “But it’s a wonderful shade,” Kyrené said by way of consolation. “And it is their City....” The three of them looked to Fancy. “How would I know?” he said and, petulantly, finished Sylvain’s la momisette for him. “Fancy.” The attenuated figure leaned over him and folded back his tattered veil. “I have to talk to you,” he whispered hoarsely. “How charming,” he said, and then recognized Èrmes. “This is of the gravest importance... I must speak to you, alone,” Èrmes said, and began to cough. Only a little amused, Fancy excused himself to follow Èrmes to a settee in the farthest corner. He laid his hat aside and took Fancy’s hands; he looked even more wasted than before and his tubercular beauty put Fancy in a more generous mood. “I wouldn’t put it that way,” Fancy said sulkily. Fancy, who was more than a little taken aback by Èrmes’ zeal and confidence in him, looked back toward his friends, hoping that Xerxinia or Kyrené would catch his eye and make some valiant signal of rescue. But Xerxinia had one shapely leg on the table, showing off her cunning slippers and stockings so delicate and fine that the purple-black bruises on her calf showed through like the marks of some august disease. The hierophantes’ house was old and very bare, and stank of damp and the River and the slow rot of stone and iron. It was in the oldest quarter of the City and listed on its crumbling foundations toward a particularly nenuphar infested canal. The upper levels were shuttered and disused, given over to a riot of baroque decay, and the subterranean levels were hardly less ostentatious in their decomposition. Fancy left Èrmes crouched miserably in the violets and shadows at the back door and climbed down the stairs to bargain for sanctuary. Fancy was expected, of course, and the silver gilt door to the hierophantes’ room was unlatched. The room was grandly spoiled. Pretty curls of mold flecked wallpaper formed the chief decoration; one wall was covered by a warped, spotted mirror. It was very damp and the sweetly narcotic scent of nenuphars was thicker than the air. Fancy was rather overcome, but the hierophantes, ibis masqued, seemed not to notice, or at least to be granted a kind of moral indifference to such miasmas by the ibis’ permanently haughty visage. Fancy had never felt at quite such a disadvantage with a hierophantes before. The ibis masque’s blank, bright eye stared down at him, and Fancy regretted losing his temper. The hierophantes was right, of course, he must be more careful about his manners. “Your fate has always been beyond our influence,” the hierophantes said gently. “I suppose that’s something,” Fancy said, and made the hierophantes’ curious genuflection of farewell which he was permitted to know, and went back up to the garden where Èrmes still waited. “I’m beginning to think that there’s quite a lot you haven’t thought about,” Fancy said. The Cathedral sat amidst a lacy network of canals and very minor tributaries, and was covered in its own lacy shroud of ingeniously carved stone and high sheets of colored glass that showed very correct scenes of Ascensions and Mysteries and a dramatically terrible Retribution. But it was almost morning, and the dove grey light outside and the dull gold light inside washed all their pretty colors out. There was one little novice, in solemn black and white, sweeping and raking the yard, tidying it for the early morning faithful. Fancy waved at him, and took Èrmes into the Cathedral through a narrow side door between two bas-reliefs of martyrs. It let into a severe grey hallway and a set of stairs going down to the charitable kitchens and one going up to the nave. There were a few novices cleaning the lamps and pulling the stubs of candles out of the glass holders, but it was otherwise deserted. Fancy had bought a bunch of pale poppies and belladonna on their way, not strictly correct but appropriate in his case, for the altar. He left Èrmes in the back and arranged them very artfully on the white cloth between the gold daggers and the shallow dish of rosewater. “That sounds like a very good idea,” Fancy said, and was asleep before Èrmes crept awkwardly out the great doors. He woke in the middle of the dusk service. The very handsome Abbé was officiating, and Fancy paid particularly rapt attention to the pretty brocade of his mitre, powdered with delicate gold medallions and split pomegranates, and the touching way he knelt to kiss the hem of the shroud. The Cathedral was full, even the galleries, as if this was the premier of a new Aubrine play; but instead of displays of piety, or the lascivious excitement Aubrine inspired, many of the devoted were weeping openly. Èrmes was gone, which Fancy decided was a kind of minor miracle that he owed to his own gods. He waited another quarter of an hour after he got bored looking at the Abbé, and, good manners satisfied, walked discreetly to the side door. It smelled like smoke outside. There was a fire three canals north, and another to the east; most of the southern part of the City was burning grandly. It was such a pretty sight and such an awful thing that Fancy simply stood there, watching, quite unable to decide what he should do or where to go. He didn’t even notice that Amfion, with a full complement of Council guards, was coming toward him across the lawn. Amfion stepped closer and took Fancy’s hands. He was beaming with a kind of loving gallantry. Fancy looked down; he wasn’t wearing the red boots. “Oh dear,” he said. “That was more than enough,” Amfion said, and signalled for the Council guards to seize him. Fancy felt that it was undignified to struggle once the authorities had caught him, and had formerly made an art of being arrested. But he was too nervous by then to follow his own precedent. They had a difficult time restraining him, and Amfion even threatened to hit him with his honorary flail of office. It was all too humiliatingly serious. They walked him, with some difficultly, along one of the canals to the River, where an unsightly Council barge waited. Fancy expected they would take him to the Council’s palace, but the barge turned west, toward the Vermillion and the docks and the oldest part of the City. It was possible that the Council’s palace had been burned already and Amfion had set up provisional headquarters in some dilapidated, abandoned townhouse, with a division of guards assigned to expel stray nenuphars from the flooded levels. They tied the barge up at a shabby little public dock that listed half underwater in the very worst part of the City. The River glowed violet and cyanide blue and coruscated with flickers of chartreuse. The streets beyond the soft banks were a cipher, intermittent coils of lights and pockets of black. The nearest street had sunk mostly into the River and the eroding bank had been left unprotected, the townhouses and courtyards given up to voluptuous ruin. The scent of the nenuphars was so heavy and heady that the Council guards had put on elegant black cloth masks and Amfion a red one. Fancy was overwhelmed, and Amfion dragged him awkwardly off the barge and along the broken pavings, the heels of Fancy’s boots catching in the cracks, to one of the flooded townhouses. It had been a charming place once, with a front garden and a façade designed in homage to Guimard, but it had spoiled in a particularly ugly fashion. Everything that had been elegant and delicate and sensual had worn down and rotted away; what was left was a kind of blocky skeleton, piebald with unhealthy looking molds. There were two feet of water in the front rooms, coated with a scummy black skin of filth and undocumented species of blood red algae. Some of the guards had cleared a path through what had been the sitting room, the formal music room, and the kitchen to the cellar stairs. There were three steps left above the water. The stink of damp and fruiting fungus gave way to the sweet, clotted scent of the River. The broad, smooth expanse of the flooded cellar was illuminated by a pale violet light where a jagged hole in the wall had let the River in. At the top of the stairs, Amfion took a bottle of smelling salts out of his pocket and waved them at Fancy. When that produced no immediate response, Amfion hit him. Fancy was, in fact, very awake but, with no better plan at hand, was pretending that he was unconscious; it would be bad manners to execute him without formally declaring the order to him. “Well, damn it,” Amfion said, his voice muffled and husky behind his mask. “I can’t wait here all night playing games, Fancy.” And he tossed Fancy, unceremoniously, down the stairs into the flooded cellar and slammed the door. The stairs had, in fact, rotted away completely below the waterline. Fancy, who had never been much inclined to swim, suffered a moment of particularly ugly panic before he managed to grasp the remains of the railing and pulled himself up onto the last step. He coughed; the cellar stank of decay and unwholesome growth, blooming mold, and small, musky animals, but over that, thick as honey, was the odor of the nenuphars. He thought he would faint again and drown, and put his dripping sleeve over his nose. That was worse. There was silence on Fancy’s side of the door. “Amfion!” He pounded on the door and yelled until his fists went numb and his voice was reduced to an unintelligible croak and it made no difference, because it was quite clear that he would not be getting out. Fancy sat down on the landing, fastidiously choosing the spot least infested with slick mold. He was tired and cold and was dizzy from the smell in the cellar. He felt rather embarrassed now at his display, and regretted that Amfion would be embellishing the story of his bad taste and anguish at dinner parties for the entire season. It was a very bitter thought, but on the whole he decided he would rather brood on that than his current circumstances or how he had come to this. Something disturbed the water in the cellar, sending out little waves that lapped at Fancy’s stair. The water rippled with violet light, indigo, flashes of poisonous chartreuse bleeding in from the River. Fancy stood and tried the door again. Now, he regretted his earlier display chiefly because it had been unsuccessful. He could hear them, little hisses and the eerie dissonance of their speech, which he had been privileged to learn during his charmed tenure as prince of the City’s Mysteries. Something touched his ruined boots and though he knew not to look back at them, it would be a relief to get it over with. Fancy looked down. Its eyes were a shade of purple impossible in nature and the shadows on its skin were as dark as bruises. It was beautiful like a gaudy, delicate butterfly and as compellingly grotesque as a carnivorous, jungle-bred orchid. Something about it reminded Fancy of Leirion. It was appropriate, but it made it very hard for Fancy to steel himself to accept what was happening. Because it knew that he couldn’t get away, the nenuphar didn’t bother to play at seduction and let its craving and purely malicious pleasure show plainly. It pulled itself up the rotting stairs, its blue-white hands faintly luminous against the blackened, flaking railing. Fancy shuddered and turned away. The nenuphar grabbed him by the ankles and pulled him down. The two guards Amfion had posted at the cellar door had been there long enough to overcome their initial disgust at their assignment, their subsequent curiosity about the florid degradation of the townhouse, and had lapsed into impatient boredom. Their comrades were doubtless having a much better time rounding up the last of the revolutionaries, extinguishing fires, performing summary executions of fractious citizens. Fancy’s punishment, though far more gruesome, was quite dull for them. They had listened to him scream and curse Amfion in very particular and serious phrases; though that had been entertaining, Fancy had been quiet for a long time now. If they could ascertain his condition, they could consider their duty here satisfied and find more pleasant work. They called and tapped at the door and shook the lock with their bayonets, but the criminal didn't answer. After a brief debate, the guards opened the door together, probing the dripping darkness beyond with their rifles. Fancy had been hoping that they would do exactly that for quite a while. He had braced himself, wet and cold, between the doorframe and the wall, just out of reach of the nenuphars, who taunted and threatened him below. He felt ill and was in a great deal of pain, and would very shortly begin to hallucinate. He might then have just enough time before the final dissolution, before the nenuphar's toxins and charms worked their last awful transformation. He had been privileged, once, to know the particulars of that metamorphosis; and though he was now corrupted and had no privileges to speak of, Fancy couldn't help dwelling on the most terrible details and noting each of them as they manifested. His eyes burned and stung, and a faint, pellucid cyan tint was already spreading from the tips of his fingers. More distressing to Fancy than the agonizing, anarchic mutations the nenuphar's poisons were spawning in his body, was the eventual derangement, and the particular ways his finer senses, what could kindly have been referred to as his soul, would be warped and spoiled. It was an impossible indignity to be subjected to, and he was rather more than a little outraged. He really couldn't let Amfion get away with this, even if he had brought it on himself. So, when the guards stepped through the door, Fancy leaned down and pushed them into the luminous water. Fancy ran through the kitchen, the formal music room, fell in the black, poisonous water in the sitting room. He was shaking and weak, his vision blurred to a haze of indigo and chartreuse, but he climbed to his feet, spitting out mouthfuls of filthy water. The scent of the nenuphar clung to him, smothered him, permeated his soaking clothes and skin so that he smelled nothing else. Fancy still tasted it: honey, pollen, and creamy skin. He staggered out the ruined door to the blessed night and the glorious, limpid River and was quite ill in the remains of some clever, lasciviously designed topiary. He would have wept in fury and real anguish, but he had passed the stage where it would have been possible. He stood on the crumbling bank and attempted to quell the most offensive mutinies of dress and grooming. He despaired utterly of his dear boots, stained and sadly scuffed, and decided that, under the circumstances, he must make the best of such pallor. He would stay to the side streets and smaller canals to avoid exposure and, with a great deal of luck, would find Amfion at the Council's little palace. It was unlikely that, if he found Amfion there, he would be able to get out and reach the River. Fancy remembered the nenuphar locked in the crystal cage; it was an ignominy that he would, hopefully, deserve. Fancy supposed, on reflection, that chief among his many regrets was that he had not worn his peacock feather mitre. It would have been just vulgar enough to give him leave to pass into desecration with a clean conscience. Sylvain, under slightly false pretences and exaggerated references, was minding the cozy home of a minor official on the Juvenile Penitentiary and Rehabilitation Commission, with whom he had once had some passing acquaintance. He, with the enterprising help of Xerxinia, was hosting an impromptu dinner party. The party comprised the official's neighbors, a lovesick and moody reformed novice, and several habitués of unsavory powder rooms that Xerxinia had suggested. Everything was going quite divinely, even the morose ex-novice had shown some interest in the conversation, and they enjoyed a spectacular view of the fires and executions to the north and east. They had only opened the third bottle of black wine when the official's doorbell, which mimicked in pretty chimes a grander toll that Sylvain was familiar with, rang. 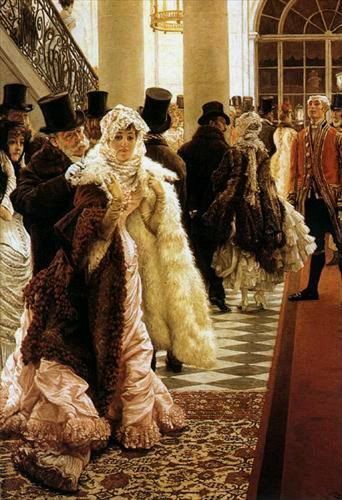 He excused himself and, chiding his absent host for not employing a servant or two, passed through the formal sitting room and into the very correct mauve and black foyer. He had expected one of Xerxinia's guests, arriving dramatically late, but it was Fancy, in an enviably ruined outfit set off by a remarkable pallor. He looked vague and very unsteady, and Sylvain hoped he had saved some favors for his friends. He sniffed delicately at Fancy's wet hair and clothes, and an expression of horror passed over his finely wasted features. He stepped back and began to make the gesture of protection, arms crossed over his chest. Sylvain stopped before he made the final act of condemnation; he was a little ashamed of having been surprised into making such a display. Fancy shivered and swayed and his head drooped. There was, at the corners of his mouth and the fine skin of his inner wrist, a bit of that peculiar translucency. Sylvain felt very sorry that he had noticed. Sylvain leaned toward him, an odd, distracted look on his face, as if he struggled to remember something he had almost recognized and that he very much desired. He had stepped through the door on the shift in the cadence of Fancy's voice and began to put his hand out. Fancy stopped speaking abruptly, and the two of them looked down, embarrassed. Fancy coughed and attempted a cavalier shrug. “I'd be so very much obliged if you could help me. I need to see Amfion, but I'm not feeling well. I don't think I could make it on my own.” He made an obvious effort to speak in his ordinary voice. Sylvain made certain to lock the door behind him. It was awful to treat Fancy that way, but he was rapidly becoming not himself. It was a great shame and keenly awkward. Sylvain wondered if it was polite to ask him how it had happened. He signaled to Xerxinia from the hall. She looked quite delectable in feathers and very high, printed silk shoes, and her elaborate harlequin green coiffure, scented with mimosa and sandalwood. He felt a real pang of regret at leaving her. Public taxis and barges had been pressed into service for the transportation of suspected revolutionaries, wreckage, guards, the dead, and various spoils of battle. Sylvain found one waiting idle when it became clear that Fancy was in no health to walk to the Council's palace and, after offering an inventive bribe, secured it for their private use. Fancy was hallucinating by that time, and did not clearly recall where he meant to go. Each nightmare lasted a lifetime and was punctured by moments of excruciating lucidity. He babbled and cursed and, now and then, appealed to his particular gods. He shook and was in terrible pain, and could not manage to apologize to Sylvain for his display before he lapsed into incoherence and torments more subtle and agonizing than what his body suffered. Fancy was sorry that he was frightening Sylvain and exposing him to such grave risk; he was succumbing faster than even he had anticipated. Mostly he was, when he could think clearly, very sorry for himself. He hoped Sylvain would come up with a better way to explain this to Kyrené and Xerxinia. He could still smell the nenuphar, and choked on its taste and the bitter water of the River. It seemed to Fancy that constellations had been born and expired in dust and an absence of light by the time the bribed driver stopped a canal away from the Council's palace. There was a perilous moment when the driver realized what Fancy was and nearly denounced him and committed him to the River; but Sylvain reminded him of the indelicate nature of their bargain and, soundly chastised, he left them quietly at the footbridge. It was dangerous here. The River was close and, on a night of such humidity and rich violence, the nenuphars swarmed and openly satisfied their peculiar hungers. Their silvery, sibilant voices echoed off the scorched buildings and the pretty, ravaged span of the footbridge. It made Fancy ill and too dizzy to stand on his own, which he tried to explain to Sylvain before he fell over. Breaking into the palace would be difficult. Sylvain had been counting on Fancy's guidance; but when he questioned Fancy about the soundness, and the likelihood of guards, around the west cellar windows, he wept, refused to repent, and coughed up clots of blackish blood. It was unlikely that they would even reach the upper halls before the final stage of the metamorphosis overcame Fancy. For a brief, bitter moment Sylvain considered surrendering him to the River. His coat was spoiled and he had done worse things for lesser wrongs. He suspected that it was pity, or fatalism, or some other flaw that made the thought of doing that so acutely painful. Exhausted, but triumphant and confident in the restoration of common order and the tolerance of small vices, the Auxiliary Provisional Acting Council, taking their rest in the airy galantes reception room, began the lengthy formalities that marked the conclusion of their service. Amfion thanked the various contingents of guards very prettily and praised the good sense of the secretaries who had filled in for the absent officers of the Council. He had just signaled their dismissal with his honorary flail of office and begun to thank several of the hierophantes, in low tones not meant to be overhead, when some trouble at the doors drew his attention. Some persons were demanding admittance, and the guards were in dispute with each other over whether these late visitors had any privileges. The inner doors banged against the patterned walls and on that breeze was the scent of the rapacious nenuphars; Amfion coughed and considered that he should order the windows and doors sealed until the most unwholesome odors had abated. He peered around the chief of the hierophantes, an attenuated figure in a hawk masque, to get a better view of the action. But, in the dissolving of provisional authority, he had only created more confusion. The guards were fighting each other and had even turned on some of the more minor former acting officials. Amfion saw Sylvain moving almost unnoticed past the doors; on his shoulder hung something that shivered and stumbled, draped in a ruined coat. Sylvain ducked around a clash of bayonets and sabres, and Fancy fell. Fancy was shaking too much to properly regain his feet, and after an unsuccessful attempt began to crawl along the patterned carpet toward Amfion. The quarrelling guards and secretaries fell back, aghast, and attempted to leave all at once. Fancy was insensible to the distress he caused; he was on the point of apotheosis and through his disordered senses he was not always certain of even Amfion's presence. He moved, it seemed to him, through a succession of rooms: the pretty hall where Amfion and Sylvain watched him with piquant expressions of horror; across a field ringed by hounds that bayed and prayed; through a silver room; toward the dreaming River under a sky which reflected its reveries back on the viridescent waters. It was perhaps Fancy's final choice; or he had, as he considered the full, terrible meaning of the hierophantes' words, at last surrendered to the flowering toxins, and the pain of the metamorphosis and dishonor became something keener and finer and altogether less concerned with those things. Fancy blinked and drew in a breath, and, ambitious, tried a second. He gagged on the scent of nenuphars, lushly sweet and revolting; and that was such a relief that Fancy was quite overwhelmed, and began to laugh and weep at once. He sat up on the low catafalque in the hierophantes' subterranean room, papered with mold-flocked wallpaper, and caught the ibis masque's piercing eye in the spotted mirror.  ”Not quite,” the hierophantes said. Nicole Votta is an editor and writer who has logged a lot of very mundane bylines, and a few more satisfying ones. She likes consistent proofreading marks, semi-colons, her indolent habits, and psychedelic sci-fi/fantasy book covers from the ‘60s and ‘70s. She dislikes 9th chords, whisky served in Styrofoam cups, and frantic notes from people wondering what happened to their Oxford commas (although she likes Oxford commas). I got the idea for this story from Ziggy Stardust. I also receive inspiration from Barbey d’Aurevilly, Gustave Moreau, Aubrey Beardsley, Lou Reed, the Venus Grotto at Linderhof, accidental sleep deprivation, swans, nature, pretending that I’m somewhere else when I ride the subway, and being forced to write creative non-fiction. There’s nothing that drives me to write fiction like creative non-fiction.